Made these up. I tried to make synergistic designs that were also character relevant. Let me know what you think. Grievous is designed to be a very unique character. He can jump as high and move as quickly as a Vader. Grievous will have an opening sequence that mirrors the beginning of his duel with Obi-Wan in ROTS – thus he will always fight with all 4 arms/lightsabers in this game. The right R2 trigger will cause slashing type attacks that deal 80 damage per strike but strike 1.3x faster than regular saber users. The left L2 trigger will cause a 4 saber stab that deals 150 damage and can only be partially blocked (damaging 75) – but also has a slower animation and leaves him a little more vulnerable. Grievous will not be able to block like standard Jedi but can “block” with the Buzz Saw ability. Grievous spins all 4 sabers (each saber is spinning around the wrist axis). The two upper arms are spinning in front of Grievous while the two lower arms are spinning at his side. He can push forward slowly (at walking speed). This ability is both offensive and defensive. Offensively it will drain 100 health per second that the sabers are hitting the opponent. Defensively the spinning sabers will deflect 75% of incoming blasters and saber strikes randomly. Block Radius is 220 degrees. This ability has 5 seconds of stamina that drains and regenerates at the same speed. Ability is active while buttons are held down and is recharging when buttons are released. Grievous spins at his hips 720 degrees while his feet stay planted. The 4 sabers are 45 degrees from each other making his upper body like a propeller. This causes 200 damage to anyone that it hits. Recharge time is 13 seconds. Deflection: Left trigger: An alternate block that will deflect ALL blaster fire directly back at shooters even if reticule isn't pointed at shooter. Also has 25% damage bounce back on enemy saber users when blocking saber strikes. Covers 90 degrees in all directions from reticle (essentially 180 degrees, i.e. everything in front of him). Functions much like Palpatine's lightening attack in that it is depleting its blocking stamina while being held down and recharges when released at equivalent rate - stamina can last up to 2 seconds (3 seconds with Epic star card). With good timing and triggering right when blaster bolts are about to strike, this ability can be quite powerful. Soresu: Both Triggers: Initiates 5 second of full 360 automatic blocking. Obi-wan can run, jump, and strike at normal speeds while ability is active. He is essentially un-harmable unless he is hit by explosives. Blaster shots are deflected at reticle that are within 45 degrees of reticle - all other blaster shots are deflected randomly. Speed Run can be used in combonation with this ability. 20 second recharge time. Speed Run: Right Trigger: As seen escaping Droidekas in The Phantom Menace. When trigger is held Kenobi runs at 1.5x speed for up to 3 seconds. Also increases dodge distance by 1.5 and jump distance by 1.5. Has stamina meter that recharges at same rate as use when not in use. •	Add up to 1 second (3 seconds total) of Deflection at .25 seconds each level. •	Increase duration of Soresu by up to 30% (1.5 seconds) for each kill while active (at 5%, 10%, 20%, 30% per card level). Cannot become greater than 5 seconds even if kills permit. Dooku was a little tricky to design because Maul and Vader already have some of his most iconinc force moves – force lift, choke, and throw. Thus I have made 3 alternatives for Dooku’s third (left trigger) ability. Dooku will have 750 health, will move at the same speed as Vader, and will jump as high as standard Jedi. He will be able to block with his lightsaber. He will also be able to block while using his Sith Lightening. Dooku will hold his lightsaber with one hand in a fencing style to honor his Makashi style. Dooku will fire Sith Lightning from his left hand while holding his lightsaber in his right hand. The lightning will fire for as long as the button is held down for up to 3 seconds max (Palpatine’s goes for 6.8 with Epic stamina). It will function just like Palpatine’s and thus be firing on trigger press and recharging on trigger release. The lightning will do 300 damage if it all lands – 100 per second (about 90 percent as powerful as Palpatine’s). Dooku will be able to block incoming attacks with his lightsaber while firing his lightning. Dooku will release a lightning burst 360 degrees around him with a circumference sized like Luke’s Repulse, that will disable all enemy abilities into recharge, put blasters into a one second disable and then cooldown, and deplete saber users’ stamina. Enemies can still move freely, use melee, and saber users can strike but have depleted stamina so can’t block. The ability can be blocked by force users and can be dodged. It does not cause damage. 1. Environmental Barrage: Dooku will bring the ceiling down on enemies in front of him – like he did against Yoda in AOTC. If there is not a ceiling he will barrage enemies with other environmental objects like trees, rocks, etc. This would be like a mini orbital strike. This is slightly unrealistic because it will be harder to program since it would have to have different objects based on maps and locations. 2. Force Throw: Dooku will lift enemies and then be able to throw them in a chosen direction and thus have enemies fly in that direction. The throw portion is triggered by a second press of the left trigger and simultaneously pushing left stick in a direction (if only the left trigger is hit without a direction, enemies will be thrown backwards like Maul). Dooku will have 2 seconds to choose which direction to throw. He can also forgo choosing a direction and just have the affected enemies hang in the air. Dooku can block, use lightning, move freely, and swing his saber while using this ability without canceling it (as long as the left trigger isn’t hit again). The ability causes no damage unless the enemy is thrown which will cause 65 damage. As a combo move, Dooku can use lightening on the lifted enemies for the first 1.9 seconds and then throw them as long as the throw happens before 2 seconds. 3. Lightning Push: This is the option that will be easy for DICE to program. It will function like Luke’s Force Push, but also have lightning (as is seen when he fights Anakin in AOTC and in various other TCW episodes). This would deal 150 damage and have a 15 second recharge time. The design focused on power, strength and speed. This build is particularly inspired by TCW where Anakin uses amazing distance jumps and quick aggressive attacks. Base health of 750, can regen 250. Saber strikes deliver 110 – The Chosen One strikes deliver 120. He can block with his lightsaber. Anakin is as fast as Maul. The Chosen One: Right Trigger: Anakin has 2 rush attacks (and a star card that increases this to 3) that deliver 150 damage. These function differently than Maul’s, Yoda’s, and Luke’s in that the attack will home in on the target that fits 2 criteria: 1 being closest to Anakin and 2: being closest to the reticle. This will attack will function as long as the target is within 20ft of Anakin and within 10 degrees of the reticle (Thus it will not go sideways or backwards from Anakin’s position and needs to be decently aimed). This attack can also be used from the air (mid-jump or in combination with Force Burst). This attack is very strong and will push through lightsaber blocking, delivering partial damage of 80. 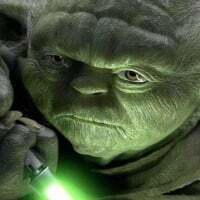 It should be noted that this ability will not push through multiple enemies like Maul, Yoda, and Luke, but instead will lock into one enemy at a time (which is partially why it is balanced that it causes higher damage). It can be used multiple times in quick succession. If the target is right in front of Anakin, The Chosen One will function much like a “strong” lightsaber swing, while at a distance it will function with a very fast force lunge (like Kylo does with his Frenzy) into a swing. The swing will be stylized above his head as he did when fighting Dooku before killing him (also imagine an overhead samurai katana strike). It can be dodged. If there is no target, Anakin will dash 20 feet forward in the direction of his reticle. Recharge rate is the same as other rush ability users. Force Lift: Left Trigger: Anakin lifts all enemies in the area for 4 seconds (it looks like Vaders choke without the choking part – Anakin really wants to choke them, but knows it’s not the Jedi way). Anakin can move freely after triggering the Force Lift (much like Kylo after his freeze). If the affected enemies are hit by a lightsaber, explosion, or mele attack, they will be released from the Force Lift; if they are hit by blaster fire, they will continue to remain lifted for the duration of the ability. This ability does not damage enemies. Anakin gets a score if other teammates damage lifted enemies (as should Kylo during his freeze). 18 second recharge time. Force Burst: Both Triggers: Anakin will burst up into the air shaking the ground beneath much like Luke’s repulse, doing 80 damage, knocking over enemies, and creating a brief stun. Anakin will go 30% higher/further than his regular jump. If he is running the Force Burst will carry forward with the momentum, thus functioning much like a jump. He can also use The Chosen One ability from the air as a follow up combo to the Force Burst. 15 second recharge rate. Windu is designed around being the best lightsaber duelist in the history of the Jedi order, even able to best Sidious. It particularly focuses around his Vapaad technique which employs incredibly fast strikes; and his unique ability to notice shatterpoints - giving him an advantage in battle. I used his duel with Sidious in the novel of Revenge of the Sith for some inspiration (I highly recommend this novel). Windu moves at normal speed (e.g. Rey, Kylo) does 110 damage with his strikes, has 750 health, regenerates 250 at a normal rate, and can block with his lightsaber. Each Vapaad Strike does two strikes in the time of a single strike and thus twice the damage. Has a very cool double stab supper fast blur animation that honors the Vapaad creature the technique is named after. Strikes have a 50% longer reach than regular strikes. Second strike cannot be blocked. He has 2 Vapaad attacks before needing recharge (a 3rd can be added with a Star Card). These recharge like Luke’s, Yoda’s, and Maul’s “Rush” abilities, with 2 or 3 levels. For 6 seconds Mace looks slightly translucent and is flickering/vibrating quickly – almost like he is phasing in and out of reality. During this ability he only takes 40% damage (can be increased to 55% damage reduction with Star Card), moves more quickly (all animation increased by 1.25x), does 20% more damage, and can see enemies around him glowing purple (much like Bossk during predatory instinct but without the everything else turning blue). 20 Second recharge time. Vapaad and This Party’s Over both can be used in conjunction with Shatterpoint. Mace charges forward like he did against Jango. He blocks 50% (damage) of incoming blaster or saber attacks during this charge. On second press, he then does the same 360 spinning strike motion he did to decapitate Jango. He also creates a larger 360 force wave around him (sized like Chewy’s Charge slam or Luke’s Repulse). This knocks down enemies and causes 200 damage to anyone his saber hits directly in the 360 swing, and 100 to anyone that is only hit by the force wave’s larger hit radius. The can be partially blocked by sabers and would then only deal 100 damage in the inner circle and no damage in the outer circle. In both the inner and outer circle the blocking saber user would still be knocked down. Run distance is the same as Rey’s or Han’s running charges. During the run he cannot be stopped/blocked by enemies - he essentially phases/dodges/passes through them until he deploys the spin attack. Recharge is 15 seconds. I especially like the Mace Windu Vapaad ability. Great work on him.